Selfridges is used to some outré types wandering its floors, but on Tuesday night the flamboyant group of exotic androgynous characters strutting around in fulsome wigs, lurid makeup and elaborately painted costumes were stopping even the most jaded shoppers in their tracks. 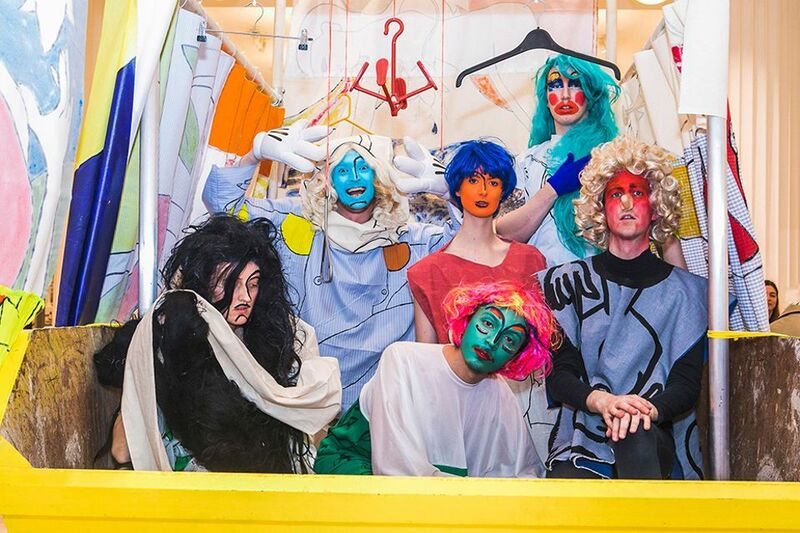 The gathering was the first airing of artist Paul Kindersley’s latest performance extravaganza The Ship of Fools which follows on from the rumbustious carnivalesque feature film he made in response to Virginia Woolf’s novel Orlando exhibited at Charleston House last year. Kindersley is also well known to The Art Newspaper as the designated stylist for our special 2018 artist-edited daily editions at Frieze Art Fair where he contributed his six-step makeup plan for the "perfect Frieze face". For Ship of Fools Kindersley and his eight fellow performers have taken medieval mummers plays and the allegorical paintings of Hieronymus Bosch as their starting point, adding a hefty dose of contemporary camp, all filtered through the languid linear aesthetic of Jean Cocteau. 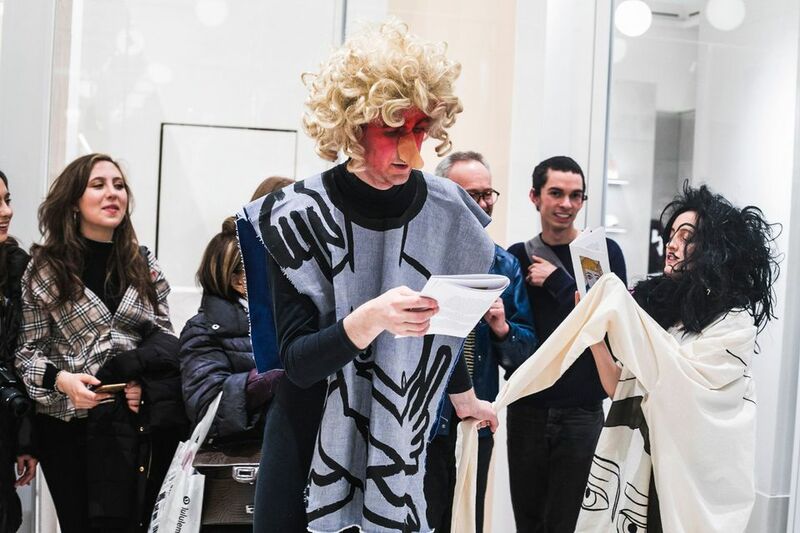 In this free-form, 30-minute production the artist was resplendent in blonde curls and black tights as The Narrator, leading a rag-tag troupe of bizarre characters including The Naked Mother, Benign Authority, The Pancake Eater and The Pearl Thief. All the action from this motley crew took place in and around a battered industrial skip, incongruously deposited between the Gucci and Chloe outlets which Kindersley has draped with banners painted with Cocteau-esque figures to become the "Ship of Fools" itself. In another twist, the repurposed skip also doubles up as the art gallery that has commissioned Kindersley’s performance. For the Skip gallery is precisely that, a mobile art space housed in a modified skip. Founded by Catherine Borowski and Lee Baker in 2017, this antithesis to the White Cube has already collaborated with Gavin Turk, Richard Woods and David Shrigley to unleash “eruptions of art” in unexpected places from Hoxton to Bristol. With Kindersley’s Ship of Fools it continues to do so with a vengeance.